If day one of the CPHFW was mostly about new designers, then the second day of the truncated fashion week was all about the Danish established brands and the ones that are getting there. So to stand out during a day of heavy hitters requires not only talent but also poise to come out as seamlessly as possible. The first show that really stood out because of its elegance was of Morten Ussing. Morten Ussing tailored his first vintage coat at the age of 14. In fact, the Danish designer has had an interest in design and clothing since childhood when he taught himself to sketch and stitch. After graduating from the Kolding School of Design as well as the prestigious Central Saint Martins School in London, he gatecrashed onto the Danish fashion scene with a collection in 2016 and has since made a name for himself with timeless yet contemporary pieces. With a very Scandinavian minimalistic approach, he creates garments that are supposed to empower women, making them feel feminine, elegant and bold. For AW19, Morten Ussing presented his collection at the Hotel D’Angleterre. The collection as a whole lacked the excitement his SS19 collection had but featured several stand out looks that are bound to appeal to its followers and fashion editors alike. The color palette featured a black base fused with several pastels and bold bright orange and shiny embellishments. The silhouettes were classic, elongated and fitted. Dresses such as the blue and black toned dress with see-through sweater-like top and bow at the waist stood out, as well as the orange knit top with an orange satin skirt with asymmetrical hemline. Another stand out was the black suit embellished with little shiny anthracite balls and the black dress with low decollate and long voluminous sleeves styled with an intriguing headpiece. Emilie Helmstedt, is the brains behind Helmstedt, a colorful and playful universe with simple yet powerful silhouettes. Her easy-to-wear 30’s and 50’s inspired loungewear were exclusively sold in collaboration with the very popular high-end boutique Holly Golightly in Copenhagen. It is not hard to see why she is so valued within the Danish industry as her ability to deconstruct color and simplify the the process of imposing them as a form of levity is unique specially in a country that values black and grey over red and blue. Helmstedt is unlikely to be a talk of the town if you lived in New York or Paris because such color palettes are not unique but it is likely to be a talk of the town due to the fantastic silhouettes it provides. Emillie’s training as a tailor is evident in each strand of fabric, and her training as an artist is equally visible in the poise which she unfurls such wonderful creations. Despite being a day full of established designers, Helmstedt stood out with the poise of a veteran and the force of youthful ingenuity. Lala Berlin was founded in 2004 as high-quality knitwear brand by designer Leyla Piedayesh. It quickly became a darling of the Berlin fashion scene and remains so. After its humble beginnings Lala Berlin has branched out to create entire collections ranging from crowd favorite iconic shawls and scarves to dresses, shorts, jumpsuits and more. Edgy but understated, sharp but with a sense of whimsy are the modus operandi for Lala Berlin and in this collection she holds the line exceptionally well. Leyla’s ability to hem together silhouettes that are tailored yet free from the shackles of rigid structure is admirable. 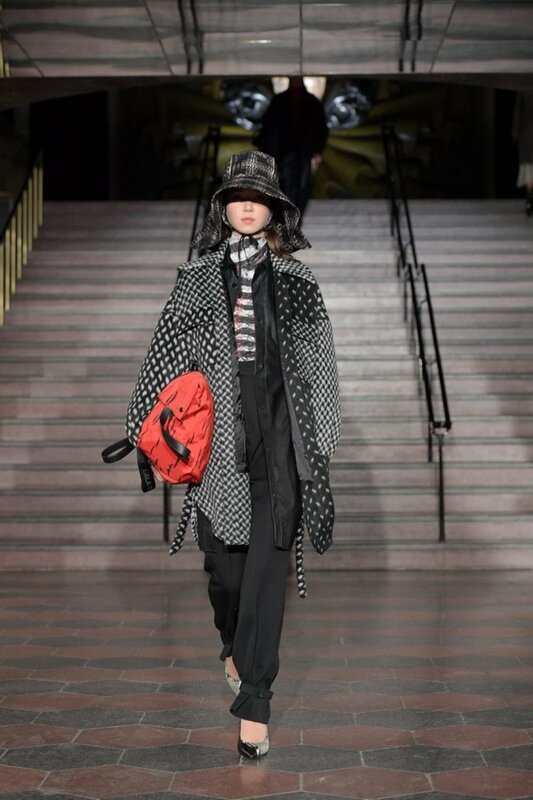 Introduction of color with whimsical sets of purses and bags made this collection by the far the most complete collection of the Copenhagen Fashion Week. And there lies the beauty of experience and talent when they mesh effortlessly. While SS19 was a somewhat dull affair both collection and presentation, Oh! by Kopenhagen Fur had certainly decided on something entirely different for their AW19 collection. Instead of a traditional runway show, the contemporary fur brand had decided to create a presentation live art at the Gallery Christoffer Egelund in the center of Copenhagen. Much in line with the DNA of the brand, this was done in a quirky and whimsical way, starting with cold vodka-slush ice on the pavement in front of the gallery. The AW19 collection named The Peculiar Collection is inspired by the peculiar women everywhere. Women who feel comfortable in themselves and dares to be different. Women like a young Drew Barrymore with big curly hair, the classy Cate Blanchett in the movie Carol, Mia Farrow in Rosemary’s Baby and British Vogue’s Fashion Editor-at-Large Julia Sarr-Jamois. Much like their inspiration, Oh! by Kopenhagen Fur had chosen a palette of colorful women of all ages and sizes for each of their live art pieces. 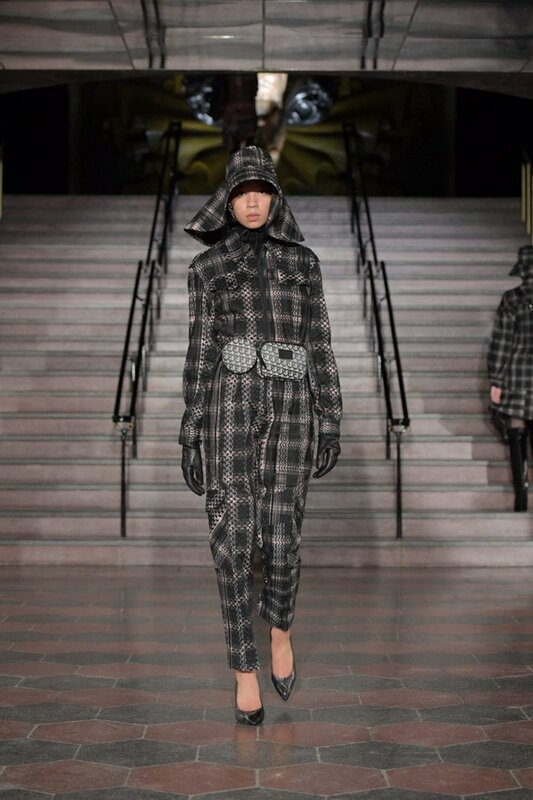 The Peculiar Collection features outerwear pieces, silk pieces, wool pieces and both leather- and fur accessories, which each made an impact in the way they were shown. Models were lined up doing everyday stuff such as ironing, brushing teeth and picking flowers, others sat down at a fancy high tea table eating cup noodles or sat down picking pieces for the wall or combing their hair each with a little quote next to them. Several pieces stood out such as the brown wool coat with big fluffy Finn raccoon fur cuffs styled with a pair of brown silk pants on a model sitting down picking pieces for the wall and the printed silk set consisting of dress and pants on a model who seemed to be pensively staring. The classic long silver blue mink coat on a model brushing her teeth and texting also left an impression along with the bomber hat of fox fur styled with white boxer briefs on a model ironing silk scarf. In the proverbial ballpark of fashion baseball, this presentation would be considered a home run.